I’d like to tell you that I’m one of those photographers who gets a brilliant idea for a shoot and then instinctively knows all of the right camera settings, the perfect location, and just the right camera angle to pull it off in one shot. I imagine this hypothetical artist getting up before the crack of dawn dressed in stylishly distressed L L Bean. An eager intern waits breathlessly as the photographer selects just the right equipment and then, as if given the most precious and generous gift, trudges about hauling the gear. Arriving at the scene, the intern scurries about setting up the equipment while the photographer gazes pensively at the tableau, chin in hand. She snaps. The camera appears. She adjusts the settings and peers through the viewfinder. With the most parsimonious of motions, she hits the trigger. Turning sharply with a wave of her hand, she signals they are done and victorious. I’d like to tell you I’m that photographer. Oh I get brilliant ideas. I’m always looking at my surroundings and imagining them in all their digital glory. Stylishly dressed in LL Bean – uh no. Intern? Nope. But I do have an amazing husband who doesn’t mind hiking up on a bridge in the middle of the night with me or driving a couple hundred miles to check out something I heard was going to be perfect. Take the photograph below. As summer burned off, I’d been watching the fog seep across the Snohomish valley snaking along the river. As I dropped off the hill each morning, I could see the spires of evergreens poking through. The landscape was punctuated by a raised rail track. I thought I knew the perfect spot. It was high enough to look down on the fog but free from power lines that would scar the picture. 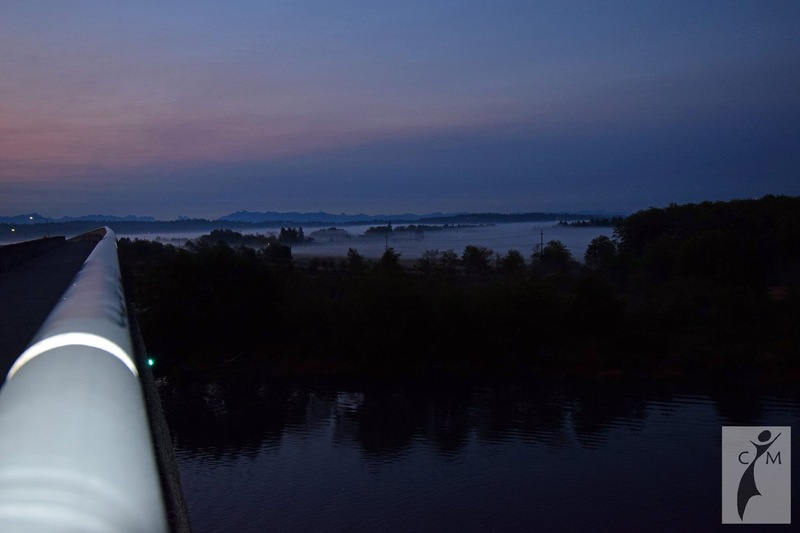 We hiked up on a bridge over the river on Highway 2 well before dawn and waited for the magical morning sun. The fog was too diffuse that morning. I didn’t get the thick contrast I wanted. I learned that meteorology is important to a photographer. The bridge rail was in my shot no matter what I did. I learned my height can be a problem and I need something to lift me up. Also bridges have safety features that keep you away from the edge. I learned I don’t like leaning over water with my beloved camera. I had a tripod so I could keep the shutter open longer but I didn’t factor in the vibration from cars. You wouldn’t think there would be any at that time day but there were and they shook the bridge. I learned the earth is a better foundation than a bridge. The truth is I probably get a good shot about 1 in 5 times. (And that might be generous.) I recently got a new computer and transferred over 23000 Images. That means I’ve shot over 100,000. This doesn’t include the years BD (Before Digital). I have boxes and boxes of those. I fail far more often than I am successful. And failing is a skill we need to learn to do better. We live in this instant, reward-based culture. We give up too easily. Some things take a lifetime to perfect. The fact is life isn’t instant or reward-based. We learn from failure. We learn the skill better ultimately. I’m a better photographer for having to figure out what I didn’t do correctly. I’m a better person for my failures. I learned perseverance. I learned compassion. I learned how to solve problems. (According to my dad, I got character.) Don’t get me wrong, I love a trophy and an A+ but I only value the ones I got the hard way. The ones born of struggle hang on the walls of my heart and mind. I’ve recently taken up watercolor painting after several years of not lifting a brush. I completed 5 paintings, one of which I consider worthy. Frustration set in and I set the paints aside, but after reading this I’m reminded that I can go back to those “uglies” and see where they went wrong and learn, learn, learn. Reading this post is timely for me. Thanks for the reminder. I’m so excited for you! Yes learn and also enjoy the journey! Thanks for reading my blog and taking the time to write. Thanks for your thoughts on making a photograph..there are many steps to create the image in your mind. But when it comes along, there is going to be some confusion and frustration when your perception changes. And then we take a few shots and we see something that works. Thanks for sharing your photos. Thanks! That is so true. It’s an amazing process. Pingback: Open to the Unexpected -Catherine Matthews Images-Life through my lens. Writer, Photographer and Artist. Pingback: Learn… to Let Go-Catherine Matthews Images-Life through my lens. Writer, Photographer and Artist.